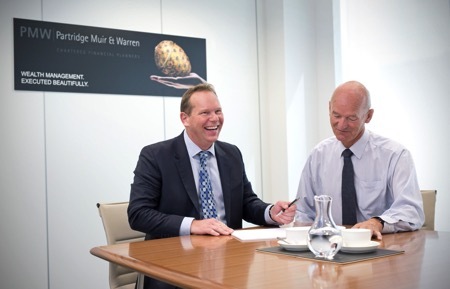 Partridge Muir and Warren (PMW), the Esher based Chartered Financial Planner and Wealth Manager, has become the Founding Corporate Partner of Elmbridge Community Fund (ECF). PMW has provided an initial donation to ECF along with a commitment to make further donations each year. These donations will be calculated with reference to the annual profit achieved by the PMW Academy Portfolio; an investment fund created to assist in the training and development of PMW staff. The investment fund was established with Company money to enable trainee staff to act as fund managers and learn from both their successes and failures before taking responsibility for clients’ portfolios. Elmbridge is one of Surrey's most affluent boroughs and often features as one of the best places to live in the UK. Nevertheless, there are pockets of disadvantage in the borough and the Elmbridge Community Fund, part of the Community Foundation for Surrey, was created to target and help those groups and communities that are often overlooked.